‘We have seen that the best team doesn’t always win the competition’ says the Liverpool boss hoping his side can fit that bill. LIVERPOOL MANAGER BRENDAN Rodgers insists that Liverpool could still win the Champions League as long as they beat Basel tonight and get a slice of luck in the knock-out stages. The Reds go in to tonight’s final Group B match two points behind the Swiss side, knowing a win will be enough to progress to the last 16. And if they make it that far, Rodgers is confident that the five-time champions can mount a challenge once again. “I know come February, when it starts again, we will be a better team because of the players we’ll have available if we manage to get through. That is what I am looking forward to. Email “Get through the group stage and Liverpool could win the Champions League -- Rodgers”. 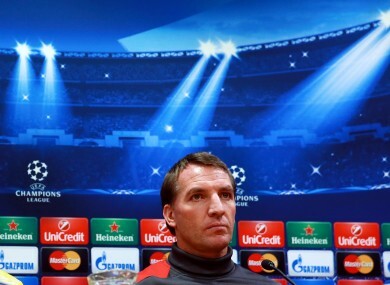 Feedback on “Get through the group stage and Liverpool could win the Champions League -- Rodgers”.